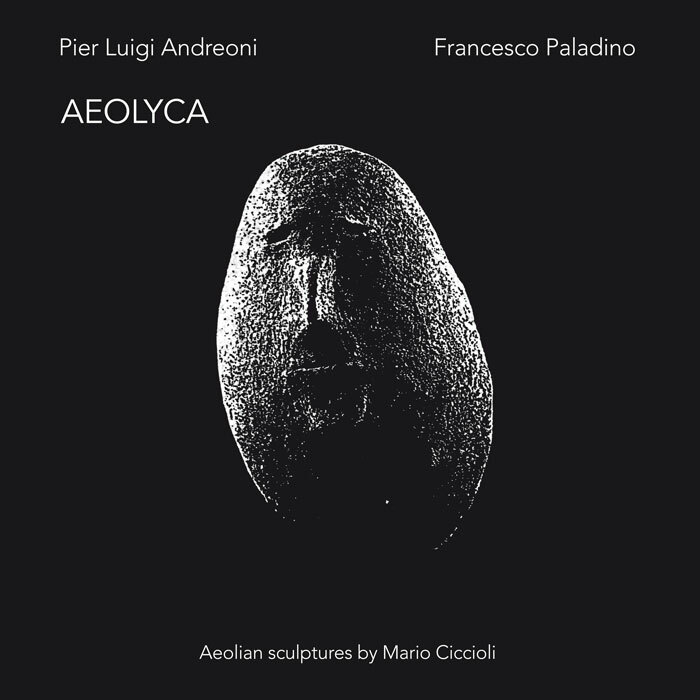 Wriggling away from any clear classification, as 80s Italian new music was wont to do, yet clearly drawing on a number of traditions and procedures, Andreoni and Paladino’s AEOLYCA project stands on its own as it intersects the two musicians’ already well established partnership in A.T.R.O.X. and The Doubling Riders among other settings with the sounds generated by Mario Ciccioli’s aeolian sculptures. Neither aiming for the organic purity of Harry Bertoia’s Sonambient recordings or the complex constructions of Mario Bertoncini’s works with aeolian harps, AEOLYCA walks a line of resistance in refusing to get with any program. The music that was produced in Andreoni and Paladino’s interaction with the recordings extracted by Emiliano Licastro from Ciccioli’s sculptures is one that breaks the boundaries between the sound and musical sources. The work is divided between the quick timings of the “Rain on the Bells”, “Sunday Clothes for Brass Bands” and “The Peruvian Club” and the longer eponymous structured compositions that bookend the record each track characterized by a dominant sonority inspired by specific iterations of globalized musics. Ultimately, though, notwithstanding their individual structural and sound diversities, the project is indebted to the sampler, the ultimate absorber, the sound source that takes up the most musical space and the possibilities of eroding sources and styles that it imposes. Further, to indicatively attest the historical context from which it emerges, the 1980s as they came to a close, AEOLYCA was originally released on cassette, that decade’s foremost format, agile, immediate, economical and for a US label (Violet Glass Oracle). This is music that has digested many of the period’s instinctive gestures. It exists as a satellite, incapable and unwilling to articulate antecedents and to nurture descendants. This is a unique work in Andreoni and Paladino’s well documented activity, individually, in duo, and in their eclectic collaborations with the likes of Roger Eno and Riccardo Sinigaglia. Like the Time Zones Festival from which this project got its start AEOLYCA is what you find on the ‘path of possible musics’.